Nokia E71 is smaller in dimensional especially in depth. but the weight is same because the E71 has a metallic case where as the Nokia E63 has a plastic casing. One main feature I found missing in both E63 and E71 is the lack of graphical smileys by default in its messaging apps. However there are other apps that can be installed to get smiley support. 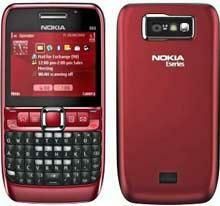 Nokia E63 has a torch facility which the E71 lacks. 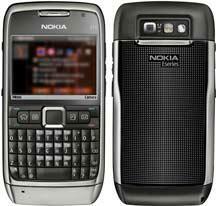 The Nokia E71 is priced around 13800 INR (299 USD) where as the Nokia E63 is priced around 9000 INR (199 USD). Both Nokia E71 and E63 run Symbian S60 OS 9.2 Version 3.1 UI, has exaclty same processor ARM 11 and speed with 369 MHz processor and display is TFT with 16M colors. Most of the other features such as Bluetooth , Wifi are of same specs. My view is that unless you need GPS and HSDPA there isnt much point spending the extra money on an E71. If you have a larger budget, the E71 may be worth it for the smaller size, looks and extra features but E63 is sufficient for most people. I came here through your blog and description you mentioned about those smart phones. All in all I like E71 for it 3g Speed., 3.2 Camera and the metallic body. Appreciate it. After read this post mobile seekers easily choose handsets.